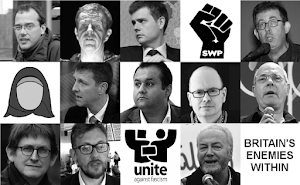 UAF, Hope Not Hate & the SWP: The Guardian is Pro-Islamist! Of course The Guardian will say that this is part of the "Comment is Free" section (see image above); which "allows diverse points of view". No it doesn't! It allows Islamists, as well as hard-core Trotskyists..., etc., to state things which even The Guardian daren't claim for itself. Over the last ten years or so, The Guardian has published articles by at least 40 or more Muslims: most of whom - though not all - have been outright Islamists (e.g. members of Hamas, Hezbollah, the Egyptian Muslim Brotherhood, MCB, MAB, Salma Yaqoob, etc. ).